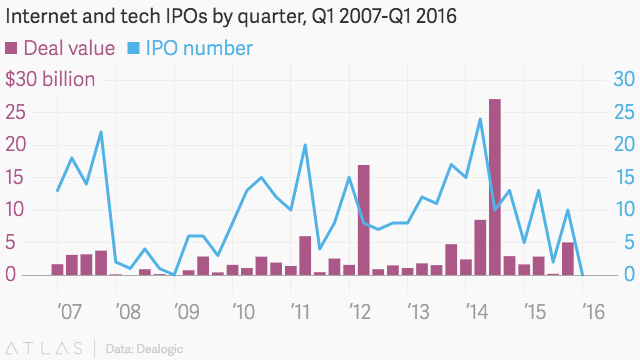 The first quarter of 2016 was the worst one for tech IPOs since the Great Recession. Not a single startup went public on US exchanges, a stunning drop off from the double-digit number of debuts that were taking place just two years earlier. By that standard, Blue Apron, the artisanal meal-kit company that’s reportedly contemplating an IPO, is already an unusual breed. But as a company that’s valued at $2 billion and considering going public, it’s even more of a rarity. Silicon Valley’s unicorns—companies with disclosed valuations above $1 billion—have been absent this year from the market for initial public offerings. 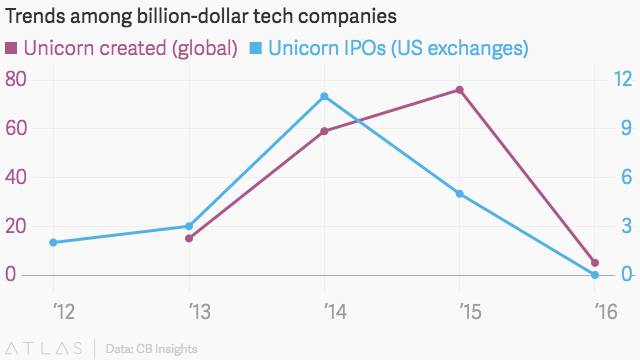 In 2014, 11 unicorns went public; in 2015, five. Six months into 2016, the count is holding firm at zero, though the broader tech IPO drought ended in April when cybersecurity firm SecureWorks listed on the Nasdaq. The irony is that there are more unicorns than ever. Worldwide, the billion-dollar startup club has ballooned to 166 members, nearly half of which were anointed in 2015. So far this year, only one has even filed to go public—chronically unprofitable cloud software company Twilio. A date has yet to be announced for the offering. It’s often said these days that the line between private markets and public markets has blurred. Startups’ ability to raise mega-funding rounds has enabled them to stay private longer, getting money from VCs and other late-stage investors that at one time could only be obtained via a public listing. 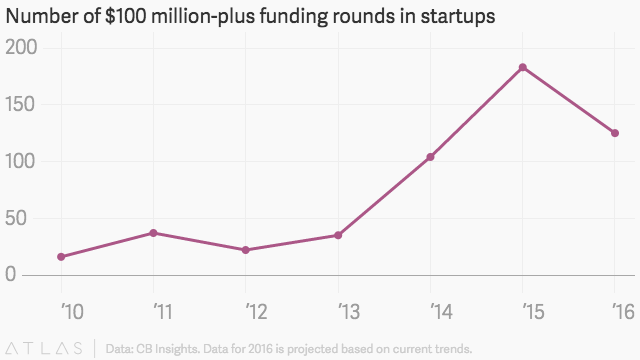 In 2015, the number of $100 million-plus funding rounds closed by startups climbed to 183. CB Insights projects that figure will decline this year, but still surpass historical levels. Some see this shirking of the IPO market as a good thing. Andreessen Horowitz, the renowned Silicon Valley venture capital firm, has cited the lack of tech IPOs as evidence against a tech bubble—especially when compared with the spike in public offerings that took place during the dot-com boom at the turn of the millennium. A spokeswoman for Blue Apron says, “We can confirm that we make money on every box.” She wouldn’t share any figures, though. Nor would she comment on Bloomberg’s report on June 6 that the company is talking to bankers about options for raising capital, including a possible IPO in the next 12 months. The unicorn designation is powerful precisely because it’s opaque. It confers bragging rights but requires little supporting evidence. So long as funds can easily be had elsewhere, why would startups give that up? The IPO drought this year suggests that, indeed, they won’t.